The most awaited fest of Xavier Institute of Management Bhubaneswar, Xpressions15 had industry experts as judges for the competitions. One such expert, shares his story with the interning IJ of Inspiration Unlimited eMagazine, for the event. Read on to gain insights from the fashion industry expert! Carnival De Vogue, the fashion event of Xpressions, is an event students look forward to from the day Xpressions is announced. Glamour and glitz are words synonymous with the fashion industry, but fashion is much more than that. There are nuances which only a keen eye could spot, and keeping that in mind we invited one of the very best in the fashion industry, Mr. Abhishek Dutta, to be our judge. Having spent nearly a decade in the fashion industry, Mr. Dutta has seen the growth of the Indian fashion industry. He says, “I have attended nearly 8 seasons of both Lakme and Wills Fashion week and a wide array of international fashion weeks ranging from Bali to Paris and London”, but fashion was not Mr. Dutta’s calling from the beginning. He was all set to tread the typical Indian career path. “I landed in the fashion industry by mistake. I was a science student. I even tried to get into an IIT, but couldn't get through”. Lucky for him, and for the fashion industry, Mr. Dutta couldn’t get into an engineering college. On being asked as to what made him join the fashion industry, he says, “I was always into illustrating and sketching. My mom brought me a form for a fashion college and I thought there was no harm in trying. In a month's time, I realized that this was my calling. My creative instincts were made for this”. As can be seen from his works, Mr. Dutta is extremely passionate about work, his excellent sartorial taste clubbed with his dedication towards his art makes him one of the best in his field. “My inspiration has always been life. Smaller insignificant things in my life to larger more substantial things that have happened to me. I have taken inspiration from all of these. From extremely complicated concepts to simple street art. I take inspiration from every aspect of my life” he adds. Fashion is an art and the definition of art varies for each person. On being asked for his take on fashion, Mr. Dutta says, “Fashion for me is authenticity. Not being artificial but being yourself. Something people can relate to”. 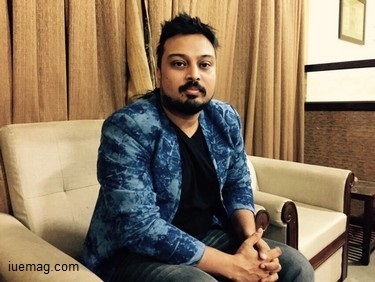 Mr. Abhishek Dutta's years of experience could be perceived in everything he talked about. Ranging from the impact of the fashion industry on the youth of today to the number of fresh avenues opening in the fashion industry each day. Really keen on seeing younger and brighter minds in the fashion industry, Mr. Dutta wants to inspire more youngsters to join the industry. “Don’t be afraid to experiment”, he says, “You may go wrong once. Go wring twice, but it only gets better after that”. There was much to learn from Mr. Dutta and I got a fresh insight into an industry which was much more than the glitz associated with it.